Service began at the railway station, where a driver from the Kulm Hotel St. Moritz awaited Edward F. Nesta and I, to whisk us away the short distance to the hotel. Staying at the Kulm Hotel St. Moritz in January 2008, afforded us with the opportunity to experience the winter season highlights of St. Moritz, the Cartier World Cup on Snow, the St. Moritz Gourmet Festival, skiing, and watching the daring men on the Cresta Run, although the hotel and the area have much to offer in all seasons. The hotel has five restaurants to select from, Le Grand Restaurant, Rôtisserie des Chevaliers, The Pizzeria, Chesa al Parc, and the Sunny Bar where the Cresta Riders meet and features Japanese specialties. We had a wonderful dinner in the Rôtisserie des Chevaliers (14 points GaultMillau) their attractive grillroom restaurant, which features classic and contemporary cuisine where Executive Chef Hans Nussbaumer tantalized our taste buds with his Lobster Salad, Monkfish, and Sole Farci. We loved exploring the 173-room and suite hotel, which is like a treasure full of surprises and discovering its secrets. The paintings located throughout the hotel will surely delight art lovers with its eclectic collection, and during our stay, we were particularly enchanted with the video exhibition by Gabriela Gerosa that required the viewer to take a closer view and watch the "painting" which is actually a framed video, that slowly changed in front of our eyes. We were rather surprised when we walked by what we thought was a framed painting of a woman, and the woman blinked at us; in another piece, Peonies I, the petals fall off a flower; however our favorite piece was The Feast, where a champagne bottle explodes over a spectacularly set table. Our spacious Junior Suite was a dream with two large windows framed with floor to ceiling window treatments that overlooked the magnificent snow-covered mountains and the frozen St. Moritz Lake where they play polo on snow and also race horses. Sleep time at the Kulm Hotel St. Moritz was heavenly with their exotic pillow menu that made me feel like I was Goldilocks as I selected the pillow that was "just right" for me, a Molino Sheep's Wool Pillow; while Edward selected the Sanavital - Multi-Variable Neck Support Pillow. Stretching out on the king bed under fluffy duvets with exquisite linens, we fell asleep almost instantly. There was an attractive sitting area opposite the bed with salmon colored love seat and round club chairs flanking a glass and metal round table, which held a lovely assortment of fruit and mixed nuts; and a large desk with a pretty pink and white orchid plant in a white pot where we used our laptop to connect to the complimentary Internet via a cable. The room had a Philips flatscreen television, a Philips DVD/CD player, mini-bar, safe, slippers, robes, and ample closet space to hold our shopping purchases and ski clothing. Other room details included fabric covered walls, pickled wood crown moldings, and an intricate wood zigzag pattern ceiling over the bed. There was ample lighting throughout the room with reading lights over the bed, lamps on the nightstands, a lamp on the desk and on the small square table next to the love seat, and a floor lamp in the corner located next to the desk. The black and white marble bathroom featured double sinks on the spacious vanity dressed with a single yellow rose in a bud vase, a combination tub/shower, enclosed toilet and bidet, a large selection of L'Occitane amenities, stool, hairdryer, shaving/make-up mirror, and a scale. As cocktail aficionados, we enjoyed conversing with the savvy bartenders in the Altitude Bar and perusing the interesting cocktail menu. Definitely not your typical bar menu, a lot of research has been done to provide a little bit of history on the classic cocktails, including The Martinez, which dates back to 1862, as well as more contemporary cocktails. 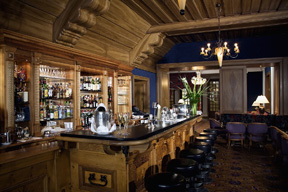 The ambience is sophisticated, the cocktails are well crafted, and there is live piano music. We enjoyed sumptuous breakfasts each morning in Le Grand Restaurant before venturing out to explore St. Moritz, as the hotel is conveniently located within walking distance of designer boutiques, ice-skating, skiing, and more. Impeccable service continued on our departure when the Kulm Hotel St. Moritz limousine drove us to the railway station. 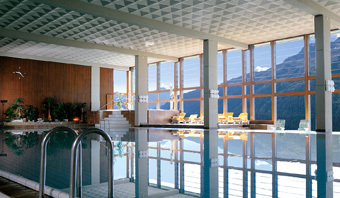 Read other articles on the Kulm Hotel St. Moritz and St. Moritz in the Destinations, Restaurants, Chefs' Recipes, Gastronomy, Spas, and Adventures sections. For information on Switzerland, please visit the website: www.MySwitzerland.com. 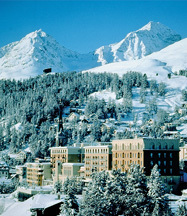 For information on St. Moritz, please visit the websites: www.StMoritz.ch/ and www.Engadine.StMoritz.ch. For information on the St. Moritz Gourmet Festival and all of its events, please visit the website: www.StMoritz-GourmetFestival.ch. 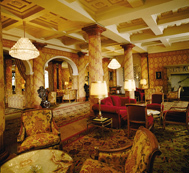 For information on the Cartier World Cup Polo on Snow, please visit the website: www.PoloStMoritz.com.